An exam survival guide including 20 daily Bible readings for stressed-out students. Exams are a time of real stress for many Christian students - with loads resting on the outcome of the results. It's a time when most need the re-assurance and guidance that God's Word can give. 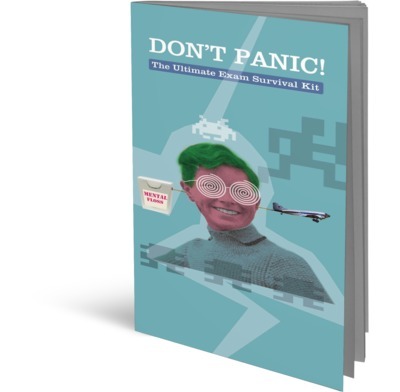 That's why we've developed Don't Panic - an exam survival guide. We've written it to encourage young people to keep their eyes fixed on God as they revise for exams. During times of stress it's easy to let God slip down our list of priorities. Bible study and prayer can become optional extras, rather than essential. But these studies will help young people appreciate that through studying God's word, God can encourage us, strengthen us and prepare us to serve Him even when we're studying. It includes 20 daily Bible readings for stressed-out students, revision timetables and practical short articles on revising effectively, exam technique and dealing with stress. Perfect for anyone who will be facing exams this year. Student interview: How do you survive? We gave a copy of this book to those in our youth group who are currently taking their CGSEs, so this is based on feedback from one of them. She liked the planner and is using it, and the article on stress has also been really useful. I think that this is a great resource. I wonder if a shorter version might appeal more to those who want something brief and snappy to dip into. Perhaps it is aimed more at 18+ than 16 year olds, so maybe a 'younger' version is what is needed. However this is only a minor quibble, as this is a really useful resource. I bought my first Don't Panic! 7 years ago from the book stall at a Lymington Rushmore revision camp and it helped me a lot during my A levels. I am now using it this year for my Law exams and have given it as a gift to a friend who is taking his GCSEs. It is so helpful and encouraging, with daily Bible studies, tips and advice, and timetables. I think I have got more from it this time around, and I'm only half-way through! The Bible passages are well chosen and remind me of the "bigger picture", which is so important during the stresses of exams. We have used this book on a number of occasions. A great way of connecting with young people and showing how much we are thinking about them at this important time in their lives. It is also a way of showing parents (perhaps those who seldom attend church) the caring nature of the church. i really liked this guide however i think it would be good if a new version was made - i have more than one year of exams and it would be good to have different readings each year. However i really like the format of the whole booklet. These Bible notes have guided me through my exams and shown me God's comfort. There isn't much I would change. So thank you, and God bless. Bite-sized chunks of Bible study were ideal for a packed timetable and focused on really helpful passages of Scripture, not just obvious exam-related issues like anxiety but also viewing present challenges from the perspective of God's plan for the whole of life and history, and reminders to maintain compassion for others rather than becoming self-absorbed when under pressure. As a postgrad some of the graphics and extras were a bit young for me, but the Bible content was excellent for any age group - I'll use it again and pass it on to others. We all need to cling to God in every situation, but exams and revising can often push God among many other things to the back of our minds. This small bargain of a book is brilliant and keeping you focused, and your life in perspective. Not only did it help me stay close to Jesus through exam time, but through showing me the extent of God's support for me, made me a stronger Christian. This book is witty, informative, comforting and brilliant for all those taking exams. I bought Don't Panic for our young people in church. Excellent practical advice. This Bible study is perfect for the exam period, giving useful advice from the Bible and from the editors as well as concentrating on things more important than exams, which was very encouraging! Was a good book, and i shared it with friends that were sitting exams for the first time, I felt the verses and studys were good, but repetitive at parts.